In today’s competitive business environment, it is necessary to attract and retain talent for organizations to remain viable. 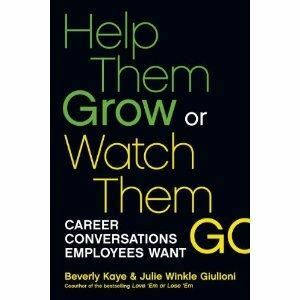 In their book, Help Them Grow or Watch Them Go, Beverly Kaye and Julie Winkle Giulioni provide practical strategies for managers, directors, or anyone involved in employee development, to have meaningful career conversations that will increase employee engagement and drive business results. Kaye and Winkle begin their exploration by defining career development as simply helping others to grow and debunking the myth that it is the sole responsibility of the manager to see that growth takes place. The authors suggest that frequent, meaningful discussions are the drivers for career development. The role of the manager becomes one of a guide or advisor who initiates these conversations using open-ended questions in the areas of hindsight, foresight, and insight. These discussions help to increase self-awareness and spur the employee to act. The ultimate responsibility for learning and development does rest with the employee; however, it becomes the manager’s job to seize learning opportunities and facilitate discussions that will enrich development. Additional myths around employee growth are also refuted throughout the book by the authors. Those include: not having enough time to hold meaningful discussions, everyone simply wants to be promoted, and that development should be focused on top performers. Kaye and Guilioni argue that organizations reach their desired business outcomes when all employees that desire growth are given the opportunity. Furthermore, managers should integrate learning experiences into the workflow when possible and hold frequent, short meetings to increase accountability and improve knowledge transfer. Help Them Grow or Watch Them Grow reads like a resource manual. Throughout the book, Kaye and Guilioni provide sample questions, templates, and practical tools that managers can readily use. For those looking to improve their confidence in the area of employee development and foster a learning culture within their organizations, this resource will equip you with the skills needed for success.